Elected to the Country Music Hall of Fame in 1980 and inducted into the Rock and Roll Hall of Fame in 1992, Johnny Cash wrote timeless hits for the poor, the sick and the persecuted. He wrote much of his own material, and was among the first to record the songs of Bob Dylan and Kris Kristofferson. The echoes of his tunes will reverberate forever. James’ portrayal of “The Man in Black” is effortless. He’s not acting like or trying to be Johnny on stage, but the resemblance is obvious. He walks, talks and sounds like the original towering American legend without effort. In his real life, James is a natural, dignified, resilient spokesman for the working man and downtrodden. When on stage playing “Folsom Prison Blues,” “I Walk the Line,” and “Sunday Morning Coming Down” his haunting voice enchantingly tells stories about prisoners, heartaches, and tales of everyday life. 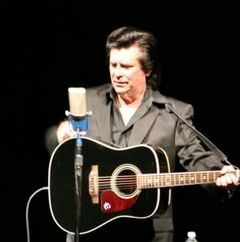 Johnny Cash’s music has a message for everyone, and James Yorfido delivers those timeless messages with class.